I never pass up the opportunity to drink in a game. I’ve visited every bar in The Witcher 3. I’ve filled Adam Jensen’s pockets with booze in Deus Ex; I’ve chugged those drinks in the bars in Hengsha and Prague, alone in his apartment, or on street corners just because. I’ve gotten Commander Shepard blackout drunk in every bar in Mass Effect. In real life, I’ve probably had a beer at my side when I did it all. Alcohol, whether real or virtual, has a pull that games both downplay and celebrate. This piece originally appeared 3/20/18. Drinking in games doesn’t feel good. It doesn’t feel like anything. A game can’t convey the burn of a good whiskey or the relief of a cold beer, but most games don’t bother to try. Alcohol is there, and then your character is drunk. Many games that have alcohol offer it as a healing item that also forces a temporary tradeoff like blurred vision or less accurate controls. It might heal you, but it’ll also briefly make it harder to fight or walk a straight line Alcohol complicates one of video games’ routine acts, similar to real life. In games, drinking’s only consequences are either ‘hilariously’ falling down the stairs or ruining your entire life. Sometimes drinking in games just functions as drinking, without the health benefits. Commander Shepard can get blackout drunk in Mass Effect, knocking back stronger and stronger brews and slurring herself into a cutscene. Drinking, or more specifically being drunk, is played for laughs in Grand Theft Auto, Red Dead Redemption, and Sea of Thieves. It blurs the screen, makes your character stumble, makes them puke. Watching a drunk character stagger around until they collapse is mostly just a boring, occasionally disturbing joke. Some games use alcohol more creatively. In recent cyberpunk game The Red Strings Club, the player uses alcohol to manipulate other characters’ moods. Through dialogue between a bartender and his clients, the game tries to approximate alcohol’s nonsensical highs and lows. In This War of Mine, a game about a group of civilians trying to survive in a war-torn city, people will get less sad when they drink. They’ll also become useless. I once had a drunk character flop outside the bathroom door and die from illness while live-saving pills waited just across the threshold. In Prey, alcohol reduces your fear status briefly, paradoxically improving your vision and accuracy. Fallout uses alcohol to boost stats like strength and charisma but will also lower some stats if you get addicted. It’s more late-stage alcoholism than everyday drinking, but it’s a more interesting take than drinking until you pass out. The 2014 hacker vigilante adventure Watch Dogs conveys the physical act of drinking as a series of minigames spread across Chicago. Protagonist Aiden Pearce can run a circuit against the city’s three heaviest drinkers, beating them in 10-round drinking contests. The drinking itself is mechanically interesting, requiring the player to perform a series of button presses and target alignments. These actions bear no resemblance to the simplicity of lifting a drink to your mouth, but they put some resistance between a full and empty glass. Watch Dogs’ drinking game, with its number of rounds, the inane chatter in its bars, and its swirling on-screen targets, shows drinking as uncomfortable excess. It shows alcohol as a trial, as something to endure. Video games tend to show drinking as a problem and also often use drinking problems as a defining character trait. Alcoholism serves as character shorthand. Max Payne is an alcoholic, as is Pam in Stardew Valley. Bioshock Infinite may offer alcohol as a healing item, but we’re also shown that protagonist Booker DeWitt has a drinking problem. The fact that booze flows freely in the floating sky city of Columbia highlights what a fantasy world the place is for Booker. There’s an achievement, “Lost Weekend,” for killing five enemies while drunk, which can be seen as both a joke and a nod to Booker’s passions for both drinking and violence. In 2016’s mellow wilderness adventure Firewatch, protagonist Henry is running from a drinking problem when he goes to work as a fire lookout. Early in his park tenure, he breaks up two teenagers skinnydipping in the lake, where he finds a bottle of whiskey. For the rest of the game he can pick the bottle up and fondle it lovingly. He never uncorks it, but his obsession is clear. Kentucky Route Zero’s Conway has a nasty past with alcohol, and the game’s interlude, The Entertainment, takes place entirely in a bar. KRZ and Firewatch, instead of portraying drinking, explore the desire to drink. They’re probably the most loving exploration of alcohol in games, even if both takes are negative. But their characters, like those in Max Payne, Bioshock Infinite, and Stardew Valley, are sad, lonely, regret-laden. What a downer. In games, drinking’s only consequences are either ‘hilariously’ falling down the stairs or ruining your entire life. You’ll have a hard time finding a video game that presents drinking as pleasure, that simulates the buzz of a cocktail, the lubrication of conversation, or the relaxation after a hard day that a cocktail, a beer, or a glass of wine might provide. There are some examples. Wolfenstein II’s memorable party scene uses alcohol to help its characters bond and celebrate after a tough fight, even if it quickly gets out of hand. Watch Dogs and Red Dead Redemption, in addition to letting you drink too much, also use alcohol to improve how you handle your guns without a deleterious side effect, hinting at the calming power of a quick drink. You can step away from the bar in Mass Effect and Red Dead before getting incapacitated, though drinking in both games is still somewhat grim, involving slamming back a drink with a shake of the head. Video games mostly focus on the idea of drinking to excess, regardless of amount. They show that the usual quantity of alcohol a person is going to drink is too much. Maybe there’s a moral undertone, an obligation to portray drinking as bad to avoid glorifying it to an audience of kids or young adults. It’s not possible to drink responsibly in so many of these games that include alcohol, nor is it possible to grapple with everything drinking can be besides being something that makes you sloppily drunk. 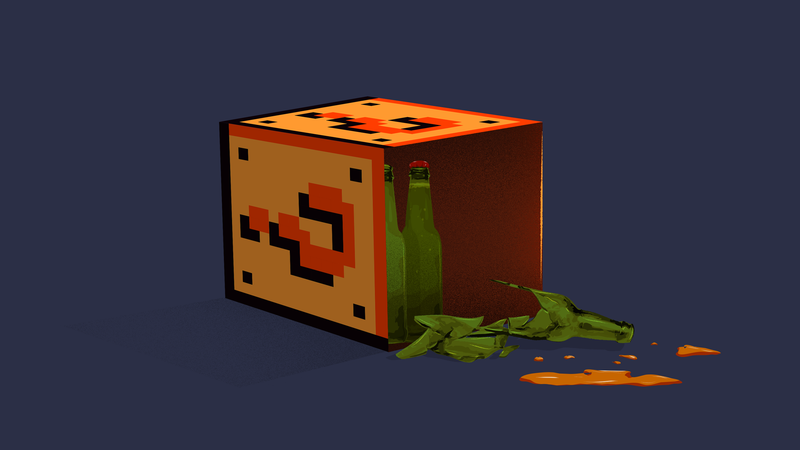 Even one drink is usually too many for our video game heroes. Games treat guns, bombs, or violent death as commonplace, rare as they may be in most of our lives. They’re not placed in games as something exceptional to gawk at or affect our hero. These same games hold up alcohol, for many people an everyday object, as a powerful, derailing disruption. They struggle with it as much as any addict, unable to hold their liquor or avoid overindulging in it. Ultimately, these games’ implied wariness of drinking speaks to alcohol’s power. In the real world, alcohol has the power to transform a moment. It makes now feel like a good idea, someplace safe and desirable. It’s something that’s not true for a lot of us when we’re sober. Video games are good at transforming the moments of our lives, too. The now of games is relentlessly enticing, much better than the reality of sitting in front of your computer or your TV clicking some buttons. They can offer the same pull as a drink, the same one more, the same possibility for addiction if you want to call it that. Many of us—gamers, drinkers, and otherwise—struggle to really be present in our own lives. The present is both overwhelming and not nearly enough. Booze makes the present feel like it will last forever, something most of us both long for and dread; so do games. The next round, either in a game or at a bar, promises a temporary reprieve. They’re a seemingly perfect match. Of course, a lot of things in life offer this time-out-of-time: music, sports, romance, art. But games don’t treat those things the same way they treat alcohol. Games play up alcohol’s uniqueness while simultaneously warning against it, imbuing their virtual booze with all the escapist threat of its real life counterpart. Alcohol, like games, promises to be an end in itself. It’s easy to take those ends to extremes, but, rare as it is to see in games, it’s also possible to find a joyful middle ground.